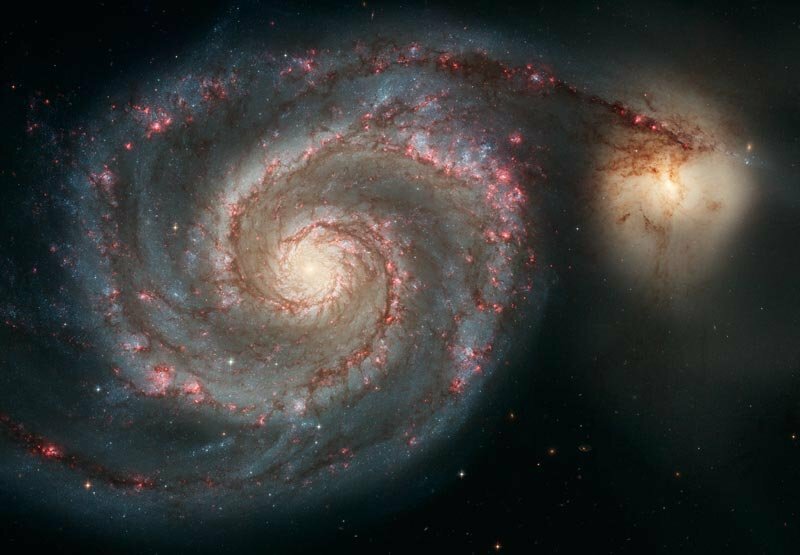 This swirling beauty is a spiral galaxy. The spiral arms are forming star clusters as gravity compresses hydrogen gas until it ignites, creating new stars. The dark color on the inner edge of the spiral is gas, the bright pink is the star-forming region, and the new star clusters are blue because they are burning very hot. The white bulge in the center consists of much older and colder stars. The white bulge at the tip on the right of the spiral is another galaxy. 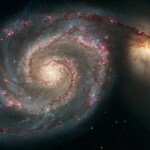 The Whirlpool galaxy, like our galaxy, the Milky Way, rotates very slowly. Our galaxy completes a single revolution every 250 million years or so. About 77% of galaxies are spiral. Informational credit to Hubble and Wikipedia.